Collaboration between Purdue and the U.S. Department of Agriculture's Agricultural Research Service (USDA-ARS) takes place in three units housed on campus. The three USDA-ARS research units on campus are the Crop Production and Pest Control Research Unit, the Livestock Behavior Research Unit and the National Soil Erosion Research Lab. All three units employ several USDA scientists who are also members of Purdue's adjunct faculty with 100 percent research appointments. Collaboration between Purdue and the USDA-ARS goes back decades, the researchers say, and it is mutually beneficial. For instance, Purdue provides research space, offices and/or land to the scientists, who often work with Purdue researchers on projects. The USDA units also employ Purdue students as interns, as graduate assistants and in other roles, and the USDA scientists frequently are guest lecturers in Purdue's classrooms. Each USDA-ARS research unit conducts a specific type of work that is meant to help agriculture and the environment on a national level. Members of this research unit are adjunct faculty of agronomy, botany and plant pathology, and entomology. 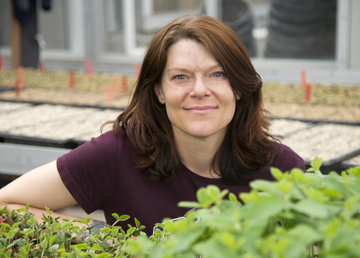 Its seven full-time scientists conduct research in Lilly Hall, Whistler Hall, the Life Science Plant and Soils Laboratory and a nearby greenhouse, as well as the Agronomy Center for Research and Education (ACRE) on U.S. 52. The unit studies disease-resistant traits in plants, particularly in wheat and soybeans, says Steve Scofield, the unit's research leader. "Our work is more effective because of our partnership with Purdue," Scofield says. "Being able to use Purdue's facilities and collaborate with Purdue's scientists and students helps us work on long-term scientific inquiries, which we can then use to help solve real-world agricultural problems." For instance, the unit's scientists are trying to understand why some strains of wheat are resistant to certain diseases and others are not. Solving that problem could lead to healthier harvests and, in turn, to better prices for farmers, Scofield says. The research that occurs in this unit focuses on animal welfare and pre-harvest food safety, says Don Lay, the unit's research leader. Its five scientists, who have offices in the Poultry Science Building, are adjunct faculty of animal science. The unit's research takes place there and at the Animal Sciences Research and Education Center on U.S. 231 north of campus. The unit's research looks at immunology, stress physiology, animal behavior, neuroscience and bacteriology related to livestock such as dairy cattle, swine and poultry, Lay says. In particular, the unit seeks the most humane ways to keep and harvest livestock while balancing the needs of farmers and other food producers. The unit typically employs at least four graduate assistants from Purdue's animal science program as well as visiting scientists who are often Purdue students or graduates, Lay says. It is the largest research unit in the country that focuses on animal welfare. "The collaboration between our unit and Purdue allows for a lot of synergy," Lay says. "For example, we often work with Purdue faculty members to complete our projects, and they often work with us on theirs. It's just been a great relationship for both sides." This facility is housed on South Russell Street, in a USDA-owned building that sits on Purdue-owned land. The work of its six full-time researchers and adjunct faculty focuses on a wide array of topics from soil erosion control to air, soil and water quality, says Chi-hua Huang, the unit's research leader. Specifically, the unit's scientists study soil erosion patterns and the infiltration of fertilizers into water supplies, among other things. The building contains a variety of research equipment, including a mechanism that can simulate the effect of rain on soil. It also contains equipment with which to study soil and water samples the scientists bring back from their field lab near Fort Wayne and the St. Joseph River. "The National Soil Erosion Research Lab is the best facility in the world to do erosion research," Huang says. "We're very happy to be located at Purdue, because it gives us access to the University's world-class facilities, and it allows us to cooperate with various academic units on campus. We're very proud to have such a mutually beneficial relationship with the University."